and i am so glad that i ordered from this brand. i know i wasn't supposed to buff it in, but i did. hence the kinda-cakey look. i'll try to follow application suggestions next time. hehehe. but i really like the finish and the light feeling. i didn't itch as well...so far, so good. as for the e/s, maybe i would need to use UDPP because it didn't last on me (with TFSI). but i love the silky feeling of the e/s and it blends easily. so that's my initial review on this brand. will continue to try this out, so watch out for my full review. I like all the photos, but my fave would be the one where your eyes are half open, you can see the lovely color and the great blending skill! you make the blue look flatter to your skin tone. gotta love the blending here! you look very pretty jheng! 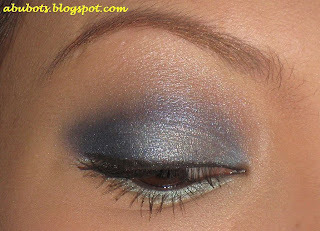 blue looks uber pretty on your eyes! and your skin looks glowing! is that also because of Pure Anada? i've been wanting to try that MMU!!! hi mhean actually that "glow" comes from my CARGO blush/highlighter. :) i have some spare shades here, i can give you. what do u think is your shade from this brand?